Patiala suit is one pattern that is inspired by traditional Punjabi dress-up. The name Patiala is derived from the name of a place in Punjab. Patiala salwar suits, were once the royal attire of the Nawab of Patiala. The shirt is short, usually ending above knee length and the salwar is a baggy with many pleats. The length of the Salwar is till ankles. The choice of fabrics for Patiala suit could be many, including: Cotton, Silk, Crepe, Chiffon, Georgette and brocade.You can wear Patiala suits for daily routine and even for small family functions or special occasions like weddings. It is very important to accessorize well for different occasions as accessories, let you make a bold statement and maintain a signature style. The right kind of accessories can instantly glam up any given outfit. 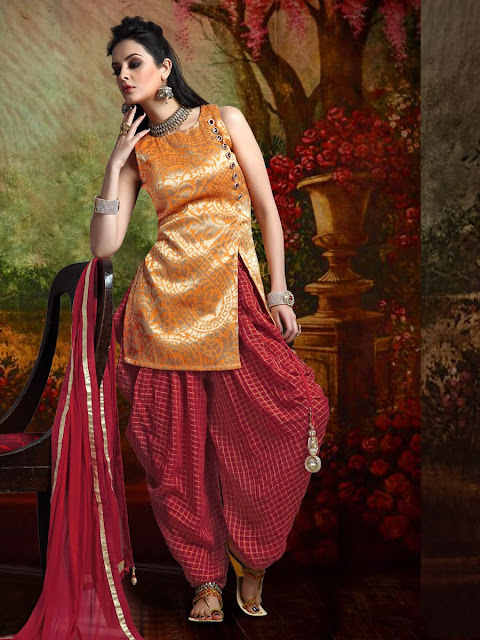 Let us check out some Patiala suits with beautiful accessories. If your style is simple and Sober, you can go for Patiala suit with plain shirts. It is not important to go for loud colours. You can opt for pastel colours like: Sea Green, Grey, Mustard etc.To make the suit more interesting, pairing it up with printed dupatta and Salwars. For daily wear, fabrics like Cotton, georgette and Crepe are good. Three fourth sleeves look ideal for office wear.To complete the look, add accessories like: Kangan, ring and earrings.Avoid the necklace as it might make you look over-accessorized for daily wear purpose. A smart pair of pumps is always welcome. If you are planning to wear Patiala suit for a party, you can add a smart jacket over the suit. Go for mix and match of sober and popping colours for a unique look. Three fourth sleeves look good if your style is classy. Use accessories like ring, bangles, maang tikka and jhumkas. If you want to look very ethnic, also go for punjabi juttis and anklets. Colours with metallic sheen look really nice as Patiala suits. 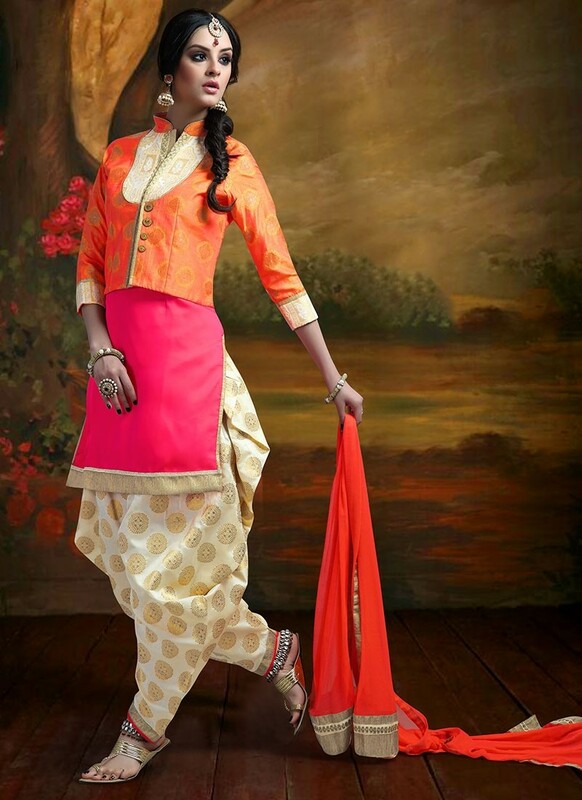 For example, this model has gone for a sophisticated shade of Peach for the shirt and Beige as the Patiala salwar. The dupatta is heavy with self print. Less is more with such elegant colours so, adding just a few accessories like jhoomar style jhumkas completes the look. What are you waiting for pretty ladies? Take inspiration from these styles and Go ethnic this season. As a light party wear, you can go for Silk shirt for your Patiala suit. Silk has a class that no other fabric can beat. Contrast chunni and Patiala Salwar make the combination look lively. You can go for smart cuts in the shirt, such as this one. Oxidised necklaces and jhumkas add a charming appeal to this suit. If you are not a bangle-person, you can go for chunky bracelets.